During The NAMM Show back in January, CHAUVET DJ introduced several new products designed for mobile entertainers. Showstoppers included the SlimPANEL range of weatherproof lighting designed for any temporary outdoor application. Created to withstand the harshness of outdoor elements, SlimPANEL Tri-12 IP and SlimPANEL Tri-24 IP provide worry-free lighting at any temporary outdoor event. Each fixture creates vibrant, saturated colour and a smooth, even wash wherever it is needed. For optimal colour mixing, SlimPANEL Tri-12 IP includes 12 3-watt, tri-colour LEDs and can withstand the strongest rainstorms without having to be covered or brought inside out of the elements. Tri 12 IP also contains innovative, touch-sensitive digital display which eliminates the need for rubberized control buttons. 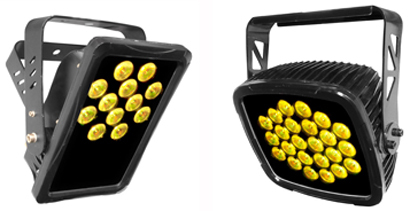 SlimPANEL Tri-24 IP includes 24 LEDs housed in a robust coating that repels water, snow, dirt, sand and salt for all-weather applications. Similarly to the SlimPANEL Tri-12 IP, the unit can also withstand a multitude of weather conditions whilst maintaining a high level of functionality.